Fondue is a fun and engaging way to serve food for a small gathering. All you need is a fondue pot, the ingredients, and some friends or family. Ingredients can vary, depending which type of fondue you want. A cheese fondue is perfect for dunking pieces of bread, cooked meats, fruit such as apples or pears, or even vegetables. An oil or broth fondue will cook juicy slivers of beef, pork, chicken or seafood. It is also perfect for vegetables such as zucchini, celery, and mushrooms. If you fancy something sweet, a chocolate fondue has endless possibilities. Dive in with your favorite fresh fruits, pieces of cakes or muffins. If you want a fondue pot which is capable of any of these cooking methods, the NutriChef countertop fondue pot fits the bill. Let's look at it in more detail. NutriChef manufactures a range of small kitchen appliances. One of these is this compact fondue pot. Measuring 10.1 by 8.9 by 6.6 inches, it is perfect for a cozy fondue party. This appliance is easy to use, simply plug it in and turn it on. The sauce or oil will be heated in the bowl, ready for dipping. The attractive unit has a dark red base and black pot. The removable cooking pot is Teflon-coated and non-stick. This makes it easy to clean after use. Two handles on the base remain cool to the touch, even during operation. This makes it easy and convenient for moving from the kitchen to your dining table, or anywhere else, for serving. An LED light on the base indicates whether the appliance is on or off. It also goes off when the unit reaches the selected temperature. The rotary-style temperature control is located on the base and can be adjusted at any time, to keep the heat just right. A heating element supplies 800 watts of power from a 120-volt supply, and the power cord measures 3.3 feet. The actual cooking bowl measures 7.9 inches across and can hold over 2 quarts. It has a removable utensil lid with grooves to hold the fondue forks. This stops them from falling into the bowl. A set of six color-coded fondue forks are included. Each person can choose his or her favorite and not get it mixed up with someone else's. The combined weight of the pot and base is 4.5 pounds. This fondue comes with full instructions. A one-year limited warranty is applied when you register the product with the manufacturer. This appliance can cook whichever fondue happens to be your preference. The high-powered heating element evenly distributes heat for cheese, oil, broth or chocolate. I love the stylish appearance and was pleasantly surprised by the large capacity of the fondue bowl. It easily caters for four to six people. The ease of cleaning the fondue pot is also a huge advantage. The non-stick Teflon-coating means no soaking or scrubbing. Reading reviews from other customers who own this fondue pot, most are also very positive. There is always a drawback, and with this appliance, I have to say it is the length of the electric cord. While the pot can be moved easily with the cool-touch handles, the cord would benefit from being longer. 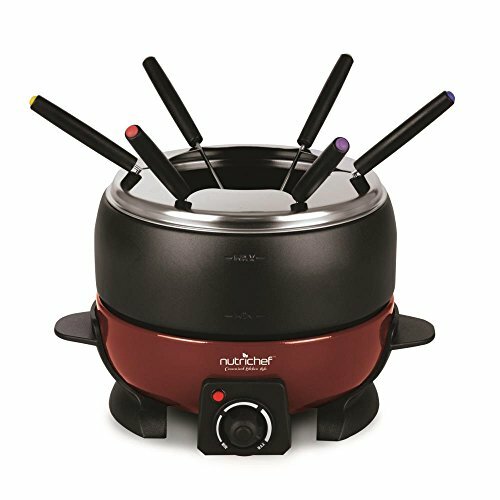 If you are looking for a reliable, adjustable, electric fondue pot, this one from NutriChef is a good option. Your sweet cravings will be met with a hot chocolate dip. It melts cheese to perfection and keeps it hot. It will heat oil or broth, perfect for meat and seafood. This means you don’t need to prepare things on the stove first and transfer them just to keep them warm. Affordable and versatile, the NutriChef countertop fondue pot will cater for your fondue parties with ease. The adjustable temperature control will keep your fondue at just the right heat. When you have finished, it can be cleaned easily and quickly. When you’re planning your next dinner party, consider a fondue as a fun way of serving one of your courses. It’s sure to be a hit with family or friends. Once it’s prepared, people can dip and cook for as long as they would like. You can sit back and bask in the compliments that are delivered on your culinary prowess.